ANUCDE was Established in 1976 with the main campus located between Guntur and Vijayawada on Chennai - Kolkata National Highway (N.H.5).Funded by the U.G.C., recognized by the Association of Indian Universities (A.I.U) and the Associations of the Common Wealth University (A.C.U) and accredited by NAAC in 2003 at B++ (80 - 85 points).An affiliating University with over 450 U.G., P.G. and Professional Colleges. Acharya Nagarjuna University Centre for Distance Education, Nagarjuna Nagar has offered admission into various UG, PG and Other PG / PG Diploma / Diploma / Certificate / UG courses for the academic year 2016-2017. 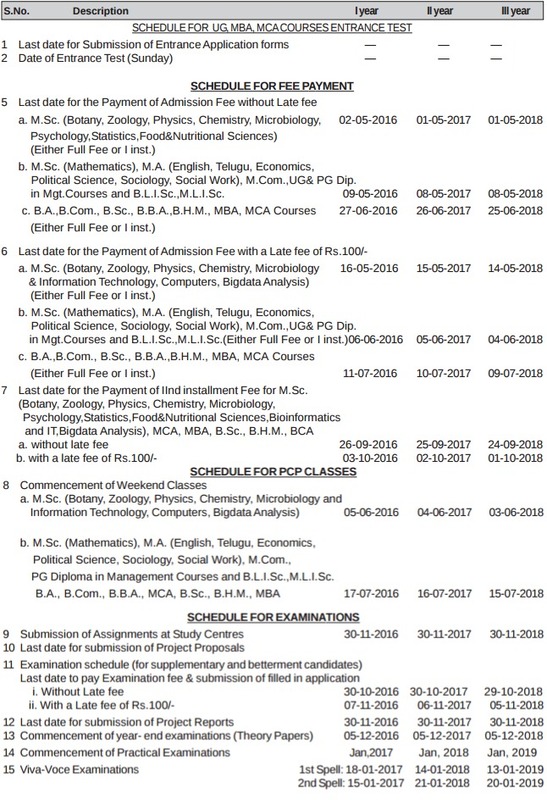 Candidates can check the complete information of ANUCDE Admission 2016 application process, courses offered and other information from this page below. Examination application forms for various courses must be collected from CDE office or can be downloaded from the CDE website: www.anucde.info or www.anucde.ac.in or can also download from the direct link provided below. Admit card is an essential document which contains Candidates Name, Roll number, Exam venue etc. and that is why candidates must carry their admit card to the examination centre to appear for the examination. Admit Card for ANUCDE Admission 2016 is now available for downloading. Candidates can download their admit card from the official website or through the direct link provided below. 1. University reserves the right to conduct examinations at selected places, based on the review of the past experience and can add new centres or delete some of the existing centres. Allotment of examination centres is the prerogative of the University and the decision of the University is final in allotting examination centre to the students. 2. University will not conduct examinations in the Study Centre and depending on the number of students enrolled, the University will make arrangements for the conduct of examinations in the same town or near by places but in some other college. In places like Guntur, Vijayawada, and Hyderabad examinations centres will be allotted in the nearby areas also because of the large number of students enrollment. 3. If the Examination Centre is located in the place where the Study Centre is located, then Students must write the Examinations in the same town. They will not be permitted to write Examination at other places. If the examination centre is not available in the place where the study centre is located, University has right to allot another Examination Centre near to the candidate’s address without giving any information. The concerned Question Paper must be available in that Examination Centre. That means, the course must be offered in the study centre located in that area. Such requisitions must be received in CDE office well in advance and at least 30 days before the Commencement of examinations with required evidence. Such requisitions must be received in CDE office well in advance and at least 30 days before the Commencement of examinations. The Result of ANUCDE Admission 2016 for UG and PG programmes is now declared. Candidates can their result from the official website or through the direct link provided below. Students appearing I, II and III year regular examinations need not fill the examination application form, since the examination fee is collected at the time of admission/beginning of II/III year along with tuition fee. Hall tickets will be sent directly to them. Only those who wish to write supplementary or betterment examinations must pay the specified fee and must submit the filled in examination application form. Examination application forms (for supplementary/betterment) must be collected from CDE office or can be downloaded from the CDE website : www.anucde.info or www.anucde.ac.in.